It’s cold and it’s Burns Night, so this scrag end of lamb broth (relatively close to a classic Scotch one) feels like a fitting recipe to post. Scrag end of lamb is the king of expectation management — the thick and gnarly end of a neck, promising very little and over delivering every time. There’s so much flavour to be had from it, best extracted via a long, slow simmer of chopped pieces, or perhaps a gentle smoke and grill of a whole neck as at Pitt Cue. Here we take the simmer approach, adding various aromatics, as well as butternut squash for sweetness, and barley for bulk, texture and a hint of starch to the resulting broth. It’s a meal in itself, though some crusty sourdough bread and good butter make a fine accompaniment. This recipe accompanied a piece I wrote on the appeal of scrag end for Borough’s Market Life magazine. 15-20 minutes prep. 2.5 hours cooking. Pre-heat oven to 140C fan. Peel the zest from the lemon with a vegetable peeler. Scrape the white pith from the strips of zest, then slice the zest into thin strips. Dice and slice the onion and garlic, chop the parsley, keeping the stalks and leaves separate. Place a heavy-bottomed frying pan over a medium flame. Add a tablespoon of oil, the onions and a pinch of salt and soften for 3-4 minutes. Add the garlic garlic, lemon zest and chopped parsley stalks and cook for 2 minutes more. The add the dried herbs, stir, and decant into a medium-large casserole or oven proof saucepan with a lid. Return the frying pan to hob and turn the heat up. Add the remaining oil and brown the lamb in batches – around 2 minutes per side – before putting into the casserole. Once finished, deglaze the frying pan with the wine, reducing the liquid for about 45 seconds. Add this to the casserole along with 1.5l of water. Bring to just below a boil, put a lid on top and cook in the oven for an hour and three quarters. Once that time is up, add the diced squash and return to the oven for ten minutes before then adding the barley. Cook for 25 minutes more. The meat should be ready to fall from the bone, the broth flavoursome, and the squash and barley tender. Season with plenty of salt, pepper, chopped parsley and a squeeze of lemon (about 1/4 of a lemon). 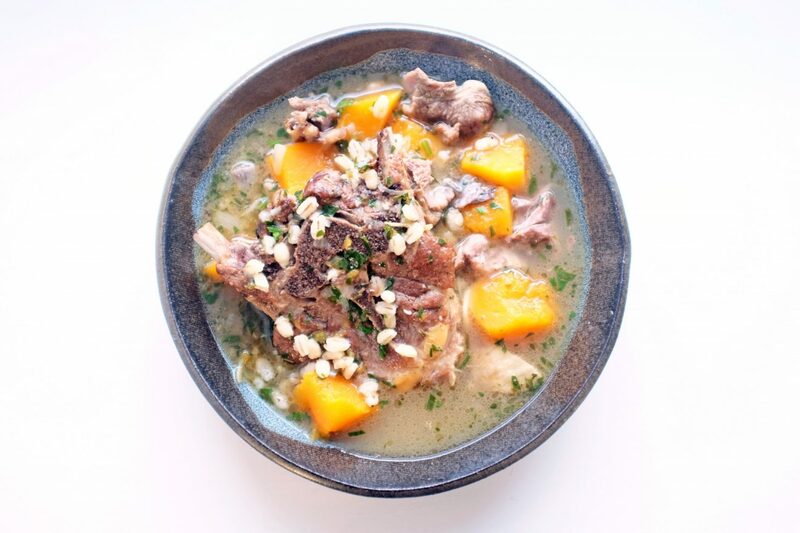 Scoop the squash and barley into bowls with a couple of scrag-end chops per person, then spoon plenty of broth over the top. Hi Ed, this sounds delicious. I was thinking this would be a good recipe to try giving my daughter as would be quite easy for her to eat (only has two bottom teeth) but would it still be good without the wine (we’d be eating it too!)? Would you just add more water in replacement or is there anything else (non-alcoholic) that would give more flavour?